Our silk wrap may be the most versatile piece we make. 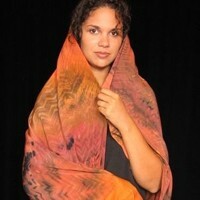 It's simply a rectangle, shibori dyed in sumptuous colors. Wear it as a scarf, shawl, sarong, turban, jacket...you get the idea. Your only limitation is your imagination. Silk chiffon wrap, 60 inches square: $140. Silk crepe de Chine: $160.